Protoplanetary disks of dust and gas are central ingredients for the formation of stars and planets. It is important to form a comprehensive understanding of these disks to assess e.g. their viability for planet formation. The work we describe here will determine if there is enough material is present in the disks to make gas giant planets (such as jupiter, saturn, etc.). We study a sample of bright disks around very low mass stars and brown dwarfs. These objects (the very low mass stars and brown dwarfs) represent a very large fraction of all stars in our galaxy, but up to now the disks around these stars were very difficult to study. With ALMA we can finally do this. The main goal of our program is to measure the mass of the dust in these disks. More in general, measuring the disk mass is necessary to understand (1) whether there is enough material to form planets or not around these objects, (2) how the disk mass scales with central object mass, and (3) how the properties of the disks evolve over time. This understanding will come through the ALMA cycle 1 high priority program “Detection and characterization of protoplanetary disks across the stellar/substellar transition” (Project code 2012.1.00743.S), which I lead in close collaboration with Francois Menard, Jenny Patience, Paul Harvey, Simon Casassus, Joanna Bulger and Christophe Pinte. You can read a more technical, in-depth description of our project below (or download the poster [PDF]). Please contact me if you would like to find out more about this work. Why are disks around brown dwarfs so interesting? Brown Dwarfs (BD) and M stars are by far the most numerous stellar objects in our universe. At young ages these objects have disk fractions similar or higher to those around the more massive solar-like stars, which suggests the possibility that they could host a vast reservoir of planets. However, although differences may exists in the internal properties of the disks around solar-mass stars compared to low-mass stars (i.e. 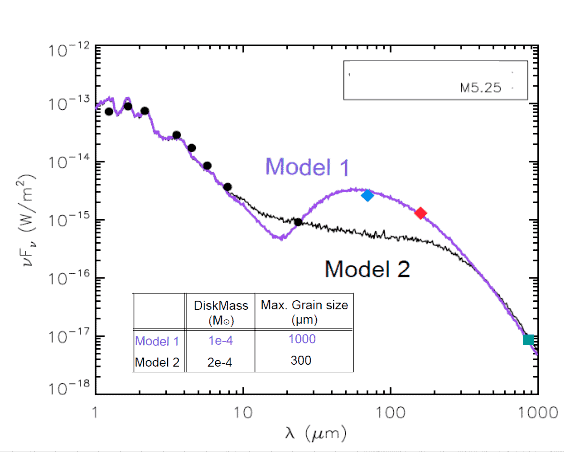 timescales for grain growth and disk dissipation), several of the key structural parameters (size, mass and gas content) of the disks around low-mass stars and BDs remain poorly constrained. These properties are critical to assess and understand their capacity to form planets. We will use ALMA (cycle 1) to obtain the 345 GHz fluxes of a sample of 32 disks around stars across the stellar / sub-stellar boundary with spectral types M3-M7, located in two nearby star formation regions of ~2 Myr and ~10 Myr old. This represents the first statistically significant sample of BD disks studied at such long wavelength. With these fluxes it becomes possible to (through modeling the SED (Spectral Energy Distribution)) extract the dust mass present in the disks. Our observations also will allow us to detect or put upper limits on the disk sizes and the CO gas content of the disks. Our research is designed to understand (1) whether there is enough dust and gas to form planets around the objects located at the lower end of the IMF, (2) how the disk mass scales with central object mass, and (3) how the properties of the disks evolve over the two age groups spanning the range of 2-10 Myr. (4) Our observational set-up is such that we also try to serendipitously detect CO emission and spatially resolve the larger disks. Our targets are chosen from the results of two successful Herschel surveys (PI: P. Harvey and PI: J. Patience; see Harvey et al. (2012) and Bulger, Patience et al. (2013, in prep.)) targeting low mass stars and BDs. It is selected to (1) maximize the number of detections and (2) to enhance the interpretation of the ALMA results with complementary 70 micron and 160 micron fluxes, hence providing a full coverage of the Spectral Energy Distribution (SED, see following). Quantitative information will be extracted from the SED and CO (non) detections with a state-of-the-art and automatized suite of codes: the radiative transfer code MCFOST (Pinte et al. 2009) and the thermo-chemical code ProDiMo (Woitke et al. 2009). The larger, brighter disks in our sample might be spatially resolved, for the other disks we derive upper limits from the beam size. Because all objects in our sample have been detected by Herschel at 70 and 160 micron. Building the SED all the way to the largely optically thin sub-mm regime will allow a statistical analysis of BD disk properties far more reliable than before (Figure 1). Figure 1: The SED from 1-170 micron is plotted for a low mass star detected in our Herschel survey (Patience et al. (2013, in prep)). Most low mass stars and BDs only have detections up to 24 micron from Spitzer. The figure shows how the Herschel detections (70, 160 micron) are important to connect an ALMA detection (simulated 850 micron data point) with the 24 micron detection to properly interpret the SED. Here, two possible models are plotted that fit the ALMA and Spitzer points, but the inferred physical properties of the disk are substantially different. The different disk masses and maximum grain sizes of the two model fits are listed in the figure.